Don’t you wish the weekends lasted 5 days and the work week / school week lasted two? Well, on second thought, I may get way less done if the school week only lasted two days. Scratch all that. Ha. Anyways, I thought I would do a post with all the details about enlarging a window. 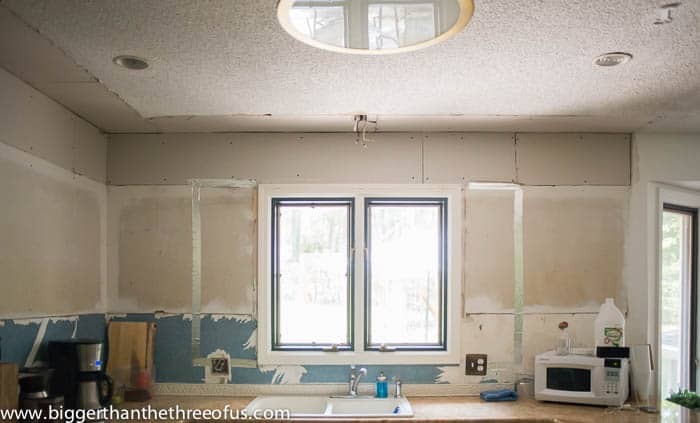 I shared a blog post on how to mud drywall so you kinda got a sneak peek of the window. Today, I’ll share what was involved and a general estimate of what this type of thing runs. I’m always curious about how much things cost and whether or not different ideas are even possible… So, hopefully this will help out those of you who are curious about enlarging a window. 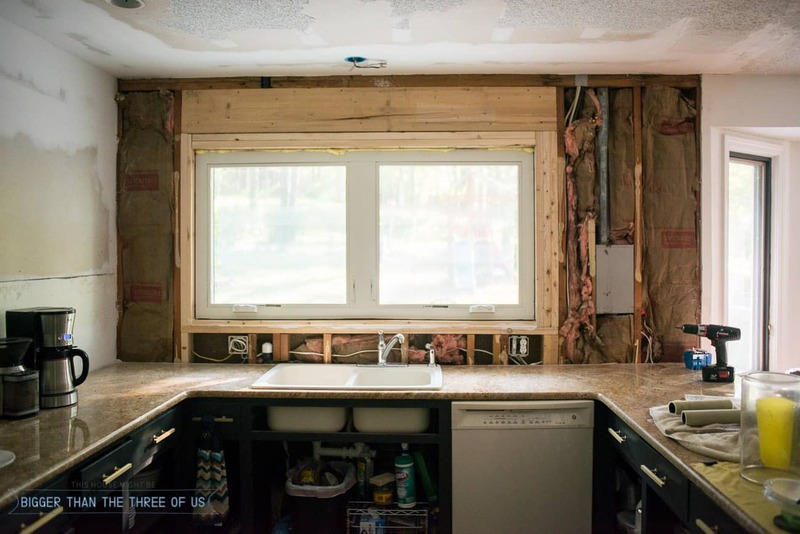 Before we dive in to how to install a larger window in a brick house and the process behind making a window opening bigger, let’s look at the before! It’s kinda crazy how good that kitchen looks when I’m looking at a construction zone in our current kitchen. 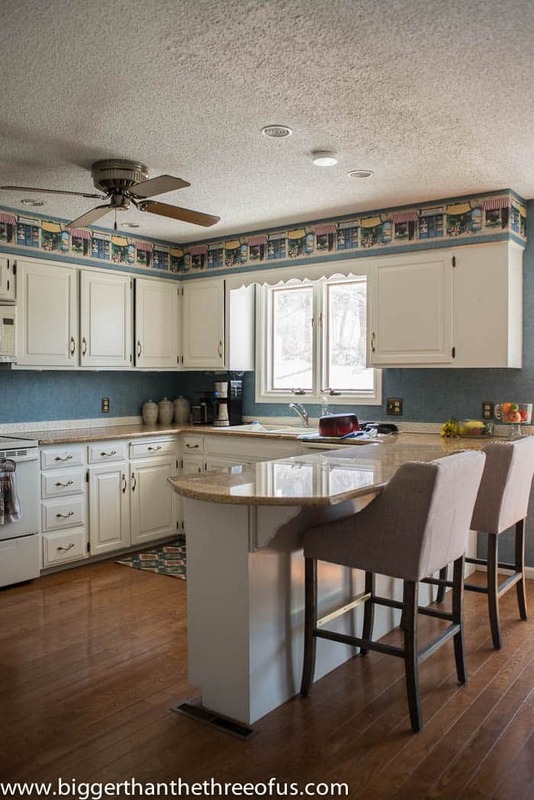 But let me tell you, after all the ups and downs… I’m so happy with the direction of the kitchen. Ok, so let’s talk more about enlarging a window opening. See the metallic tape? That’s roughly the size that we ordered and had installed. The only difference is that we did have the window centered above the sink. Who doesn’t center a window and a sink? 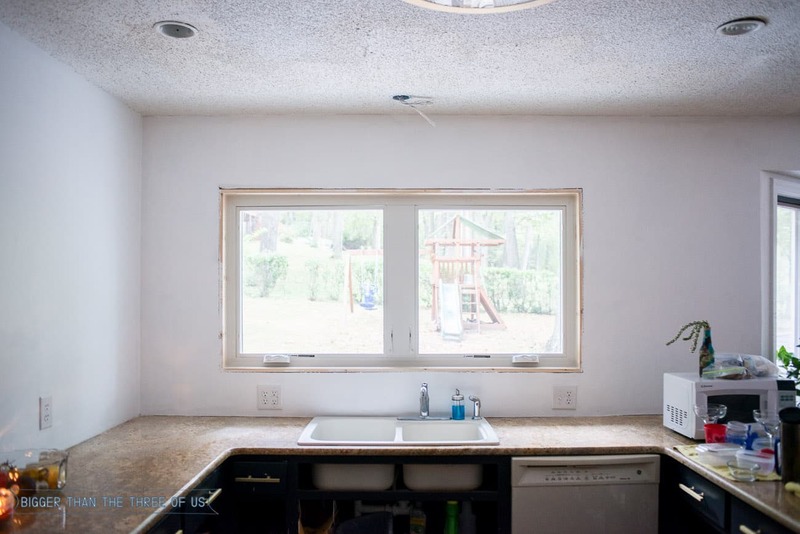 I think that’s so random that the original builder would place a window over a sink and not center it. The original window size was 38” x 36″ and the new window is 70” x 36″. We specifically wanted a window that would match with the existing windows in our house. I really liked the idea of a french casement. We would like to be able to hand bbq stuff in or out the windows and also possibly add a bar on the outside of the window on the patio. We ordered a french casement and it arrived without my brass hardware. Two weeks went by with calls and issues and finally I find out that this specific window can’t be ordered with brass hardware. To get the brass hardware in the size/type of window… it would be another $1000. What? No thank you. So, I took the window that came in (with white hardware) and the antique bronze hardware (extra $50) was ordered. The construction guys were here about 3.5 days! Crazy, right? To take the window out in the first place they put a support beam up about 4 ft in from the original window. Then, they took the old window out and all the drywall (poor Luke… he ended up doing part of the window wall and he didn’t need to!). After they got the window out, they rerouted plumbing lines and electrical lines so that the new window could fit in. Next came the brick work. The construction guys tacked in a piece of plywood so that the brick dust didn’t get everywhere. Taking brick out is quite the job! Apparently our brick length can’t be sourced, so the guys were super careful to preserve the brick upon demolition because they knew they would have to reuse it. They exposed so much of the outside, that I asked how hard it would be to add some outdoor sconces. We had no backyard patio lights, so I knew it would be great to add something back there. They said it would be super simple, so I ran up to Lowes and grabbed some modern patio lights. For $12 and a modern style. They definitely work for now. All the brick had to be put back in, the soldier-style casement had to be recreated and all the finish work on the outside had to be done. They got all of that done and I think we all were pretty happy. We had multiple issues getting the right window, so I’m sure they were happy to be closing in on the finish line for this job. They finished the drywall mudding inside but it was not in the bid to trim out the inside of the window. I’ll share a post, hopefully next week, on trimming out the window. I did it by myself, which I’m pretty proud of. At that time, I’ll also do a side-by-side comparison so that you can see the before/after. It’s kinda hard to get a visual when the window isn’t pretty yet. *I’m sharing the details on the cost of enlarging a window because I think it’s something that’s generally lacking on the web. A lot of times, I want to consider a new project like this one and just have no idea about what it will cost. So, hopefully this will help. Also, remember we live in MO which may run cheaper than what it would in the coastal states. We ordered a fiberglass window in the french casement style and it was just over $875. The labor was right around $1400. This was a pretty big job and took two guys about 3.5 days to complete. It was a big investment for us and one that we just weren’t sure about. In the end, we love our backyard view and we love getting great light, so we decided to go for it. We LOVE the new window and think that it’s really going to be the focal point of the kitchen. 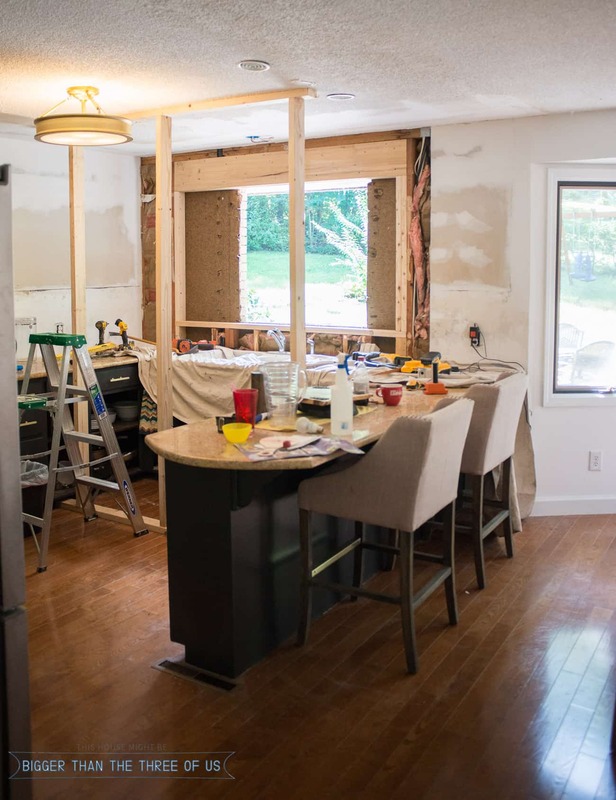 See the full kitchen reveal for all the details on how it all came together!